Under the huge chimney of the Old Power Station, Elektra Ljubljana, two buildings divided by a long corridor, give access to the converted space of tall ceilings and old black furnish machinery of the Bunker. This particular front of the house and theatre space will host tonight the second part of No Time For Art 0.3 by Laila Soliman. The performance devises into a rectangular platform lit from the sides and front. This intimate space, concentrates all our focus and awake the senses of hearing and watching. There are two monologues happening at that time, facing the audience and telling two separate but interlaced in time stories. 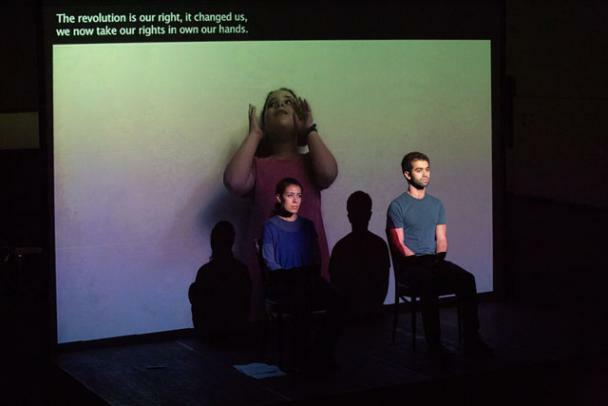 In a shape of testimony the voices of actors take us along into a world not lived before; the Egyptian Revolution individual reality. It reveals the messages that two men express to their outside people whist been kept in prison and in military forces. Images of letters and translation of text from the arabic language spoken, run on the screen through all the piece. A prerecord video from a girl telling her own experience connects the beginning and ending and add another layer to the performance. We are witnessing and receiving a fragmented story about PEOPLE. There is a coordinate movement of the performers, front and behind, sit or standing. The voices are rhythmically constant as well as the emotional level. Images randomly get into the bodies animating or disfiguring the mise-en-scéne. The talk after performance focuses on issues related to the context of the Social and Political Egyptian situation and losses the essential; the sense on the performative meaning and devising. I am curious how we would have perceived No Time For Art 0.3, if exploring more in depth how language can function in the body at different levels of sound and movement, to create, a more engaging rhythm. Also, how to include more ways to work with this wonderful materials to approach to international audiences.